There are a couple new features that Google rolled out recently to Google Sites and they are worth mentioning. The first is a Layouts option for inserting a pre-defined page layout template that will help website designers create more visually appealing web pages. The other is a Button element that will allow you to create a web button that can link to an internal page or an external link without having to generate the graphic separately. 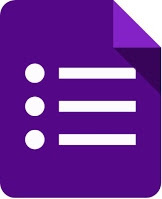 If you thought the quiz feature built into Google Forms was cool, it just got better! There are several new abilities that teachers can utilize to enhance their use of Google Forms Quizzes. If you have never created a quiz in Forms, start a new form and head over to the Settings menu and then the Quizzes tab to activate the feature. You will be pleasantly surprised at not only how easy it is to build a quiz, but the meaningful data you receive once the students have completed your quiz. 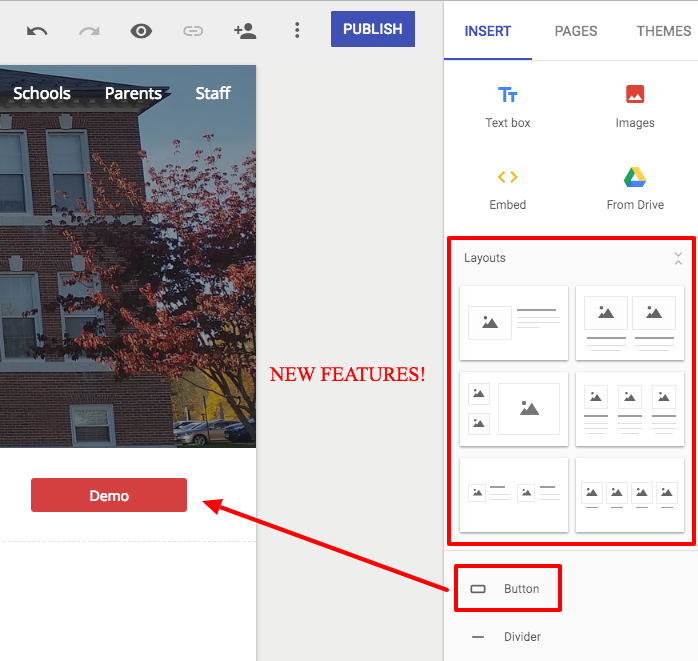 For more information on each of the new features, check out the Google blog at: https://blog.google/topics/education/6-ways-quizzes-google-forms-are-getting-smarter/. 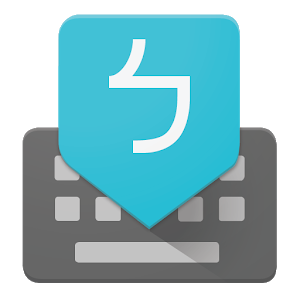 A Spanish teacher recently asked me about typing in a foreign language in Google Forms. In an effort to find an easy solution, I turned to the Chrome Web Store and found Google Input Tools. With over 80 supported languages, adding this extension to your Chrome Browser affords you the ability to write in a foreign language simply by changing the keyboard selection and using hotkeys for special characters. Give it a try today or pass this on to someone you know that would benefit from this tool. The "Just Read" Chrome extension is simple yet very powerful in its execution. Add this extension to your repertoire and you are instantly able to remove all the clutter from around web pages such as the page's styling, ads, popups, and comments. This tool simplifies the page you are reading and is completely free. You'll find it in the Chrome Web Store...try it today! 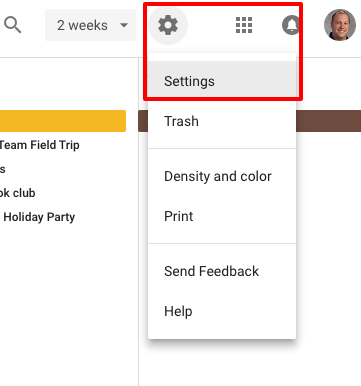 With the latest release of the new Google Calendar, we have seen a refreshed look that follows the approach that Google has taken with several of their other services, such as Classroom, in making them look more universal across the platform and easier to navigate. That being said, there have also been a few feature releases as well. One such release is the side by side calendar view in Day View mode. 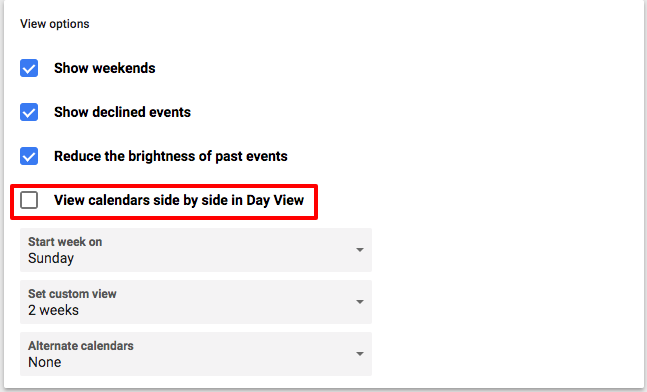 This feature displays your calendar and your "Other calendars" in columns next to each other rather than layered together in one view. For some, this is not a welcomed change and here is how you can simply change that option. Navigate to Settings and then View options and deselect View calendars side by side in Day View.